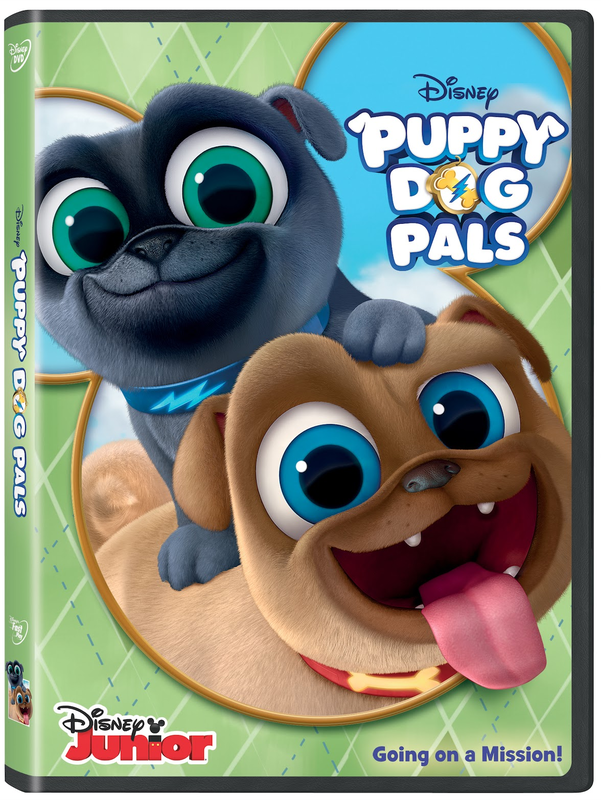 ThemeParkMama: Disney's Puppy Dog Pals on DVD Today! Disney's Puppy Dog Pals on DVD Today! We no longer have cable television but my kids are able to keep up with shows when visiting their Nana's and one of the newer shows that my kids have taken a liking to is the new series Puppy Dog Pals. The series is on Disney channel and it involves two adorable pug puppies Bingo and Rolly who's owner is a dog toy inventor. So while their owner Bob is out inventing dog toys the pups go on missions which involve some of Bob's inventions. The all new DVD is in stores today for you to bring home and share with your little ones. The Puppy Dog Pals DVD is packed with 6 episodes which is a total of 12 adventures. Your little one will be sure to enjoy them all. They're cute, cuddly and all collared up for pup-tacular adventures! While their owner Bob is away, adorable puppy brothers Bingo and Rolly embark on exciting missions stretching from their own backyard to amazing locations all around the world! With support from their "big sister" Hissy, a neighborhood full of animal friends and Bob's high-tech inventions, these hilarious heroes are always ready to unleash totally paw-some fun! Don’t miss the action-packed stories of these fun-loving pug brothers and pals! Bring home over two hours of adventure on Disney DVD April 10th!